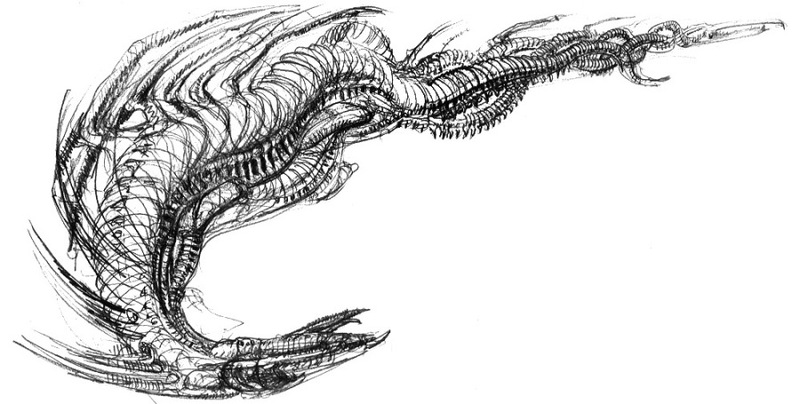 (17th December 2015 exploration:) Giger was asked to design a dragon for the movie Reign of Fire and he managed to contribute a sketch before pulling away from the project. 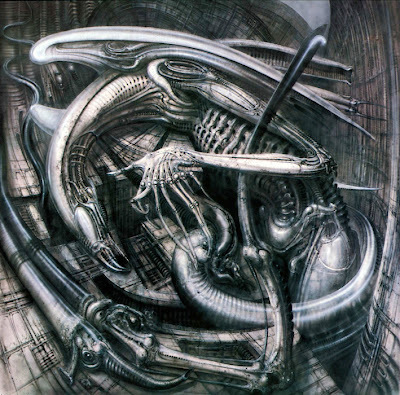 (See article: Sovereigns of Fire at the Monsterlegacy.net website to read about the Reign of Fire production) One can take a look at Giger's Alien Monster IV painting and make some comparisons, generally the beaked serpentine body, and the way the neck and head are positioned. (17th December 2015 exploration:) The dragon sketch has wings that are like tendrils or insect limbs. In the celtic known broach below, one sees simplified wings made from pipe and perhaps Giger would transform these into tendrils or limbs similar to the legs of his original facehugger designs and just about as wing like as his original alien design's back pipes that were perhaps evolved from the sphinx wings made up from tubular forms from Ernst Fuchs Triumph Of The Sphinx, and here the wings seem to continue with that sense of uncertainty about what they are. The back tendrils could also be compared to those on the back of Jean Delville's Treasures of Satan (See Alien Monster IV (1978)) The creature also has at least three tails weave together like a braid, almost like an atrophied celtic knot. The very end of the tail appears to end with a pincer, and perhaps this almost seems like a dragon bracelet.